Have you ever had a massage? Recently, I had a massage and it started out so relaxing but as she began working on the tender areas … it kinda hurt. My instinct was to tense up and then I remembered what I taught for years to each my prenatal clients at the hospital. “Relax your body and the pain will not be as intense”, I'd say as they sat on the floor breathing rhythmically, surrounded by pillows. As the massage therapist worked the knots in my shoulders, my natural response was to tighten up. I actually held my breath. When I relaxed my shoulders and began breathing again – sure I still felt it – but it was not nearly as strong. I relaxed and put my trust in her very capable hands. My body yielded and the knots were released. Then as I lay there I began to think of the scripture that refers to God as the Potter and how we are the clay (check out Isaiah 64, specifically verse 8). 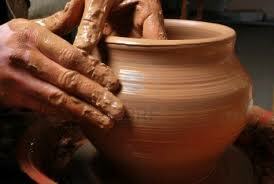 I began to think of how we as believers need to yield constantly to the Potters hands. Sure we can fight, run, tense up and get stressed or we can surrender ourselves to God’s love for us. We can choose to trust that God is control and that God is shaping us, molding us, preparing us for God’s service. We are God’s masterpiece, after all! Will we still feel pain? Perhaps yes, but surrendering to God’s faithfulness and love will allow us to deal with it better. We are like clay in his hands. Yield to Him. Allow Him to create you into the person He would have you be … a person fitted for the purpose of bringing glory and honor to Him. This week we are continuing our 40 day faith journey. We had a wonderful turn out last Sunday evening. Please consider joining us as we dig deeper, get to know one another better and discover our calling! It is not too late for you to join in on a small group, so please come at 7 pm! !